Chinese Vice Foreign Minister Le Yucheng urgently summoned US Ambassador to China Terry Branstad on Sunday to make solemn representations and strong protests against the US' groundless request to Canada to detain a senior Huawei executive. China urges the US to take immediate measures to correct the mistake, which is "extremely odious," and reverse the arrest order, saying it will take further response, Le said, according to a statement by China's Ministry of Foreign Affairs on Sunday night. Le also summoned Canada's Ambassador to China John McCallum on Saturday to make solemn representations, saying Canada will face grave consequences and be held accountable if the country does not immediately release. Chinese experts said on Sunday that the serious consequences may include trade sanctions, degradation in bilateral ties and the Chinese people's loss of trust in Canada. Ni Feng, deputy director of the Chinese Academy of Social Sciences' Institute of American Studies, told the Global Times on Sunday that the US is using Canada as a pawn and that damaging relations with China will in turn hurt its own interests. Li Haidong, a professor at the Beijing-based China Foreign Affairs University, told the Global Times on Sunday that trade between the two countries is likely to be affected in the wake of the incident. Bilateral trade between China and Canada reached C$46.6 billion ($35 billion) in the first half of 2018 and China remains the second largest trading partner to Canada, according to data released on the website of China's Ministry of Commerce in August. Personnel exchanges may also drop, as less businessmen or tourists will go to Canada if their personal safety cannot be assured, Li said. The Canadian leaders failed to foresee how thing would turn out and how seriously China would react to the matter, Li said, stressing that China sees the case as political instead of juristic as Canadian leaders said. Meng was arrested in Vancouver on December 1 and faces extradition to the US after she was accused on Friday of breaking US sanctions on Iran, the BBC reported on Saturday. The case was adjourned until Monday, as the court decides whether to allow bail, the BBC reported. "We will continue to follow the bail hearing on Monday. We have every confidence that the Canadian and US legal systems will reach the right conclusion," a Huawei spokesperson told the Global Times over the weekend. Meng did not break any Canadian law but was detained by Canadian authorities at the behest of the US, said a Xinhua News Agency commentary released on Sunday. The US has always put its domestic law above the international ones, and Canada is paying the bill for US' bullying tactics, Xinhua said. By giving in to the US request, Canada is showing that it is more of a dependent state to the US rather than an sovereign country, Li said. It is a serious human rights violation to handcuff a Chinese citizen and treat her like a convicted felon prior to a trial and judgment, People's Daily said in a commentary on Sunday. "How can a civilized country do such a thing?" People's Daily questioned. "The Huawei CFO has health issues like high-blood pressure and sleeping disorders, and is still in recovering from neck surgery in May. Yet she could not get the necessary humanitarian accommodation from Canada," the Xinhua comment said. Meng's detention happened as China and the US agreed on a 90-day trade truce to relieve their tariff spat and repair their damaged ties. "The timing could hardly be worse, and from what can be told, it reflects the overall chaos of the Trump administration," said a Saturday commentary of the Washington Post. 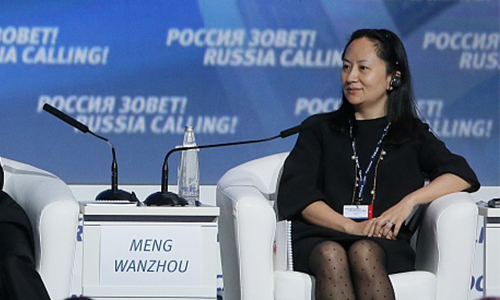 "The case against Huawei and its executives may be legitimate under US law, but a hideous political mistake," the article said. Analysts said it is worth noting that the containment of China and the country's technology comes not only from the US, but also its allies. Australia and New Zealand joined the US in banning Huawei from providing technology for their 5G rollout, CNBC reported Wednesday. However, not all countries are following the US. French Finance Minister Bruno Le Maire said on Friday that investments by Huawei are welcome in France, Xinhua reported. Western media like German publication Der Spiegel also questioned US accusations against Chinese companies, saying that the US never provided any concrete evidence, and that mistrust of Chinese products is limited in Germany despite US claims they are not trustworthy. Aside from China, other emerging markets also face containment from developed countries when they challenge the latter's vested interests, and the reform in international organizations, such as the World Trade Organization and World Bank, should help curb the dangerous trend, analysts said. The reform in those organizations should prevent countries from "politicizing" normal trade or using non-market power to contain the development of a foreign company because of its good momentum or the high quality of its products, Li said.